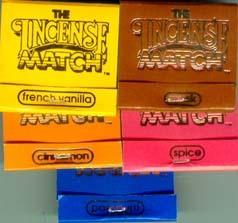 Incense Match Books from The Realm of White Magic Product List - 16 Fragrances to choose from. A great addition to your altar. Incense Match Books are a fine altar or table item. Very Unusual! Choose : Bayberry, Cherry, Cinnamon, Coconut, Frankincense, French Vanilla, Holyberry, Jasmine, Musk, Oriental Blossom, Patchouli, Pot Pourri, Rain, Sandalwood, Spice and Strawberry. "Lights like a match. Burns like incense" E-Z to carry and an E-Z air freshener. Follow the directions inside each book. You light the match let it burn down 1/2 inch and either let it extinguish itself or you blow it out. Now it becomes a stick of incense, emitting a fragrance ( 16 different fragrances are offered). Hold the Incense Match between your fingers or place it in a shallow ashtray. The original incense match eliminates odors and refreshes the air anywhere. Use to light your candles, charcoal, etc. Brings a subtle scent to the area. 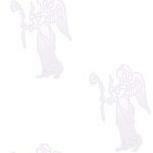 Use in rituals or spellwork to add to fragrant vibrations and your intent. Great for the bathroom, lighting a match can also neutralize undesireable scent. Great for cars, kitchens, sickrooms, wherever you want to add a fragrance or eliminate an odor. 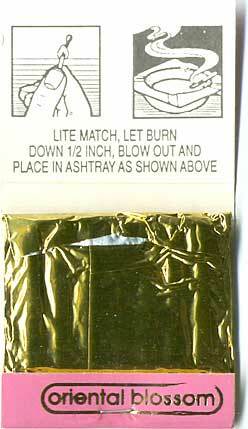 Each match book contains 30 matches and is gold foil wrapped to preserve freshness. Make great gifts for family and friends. A great portable air freshner for travellers.